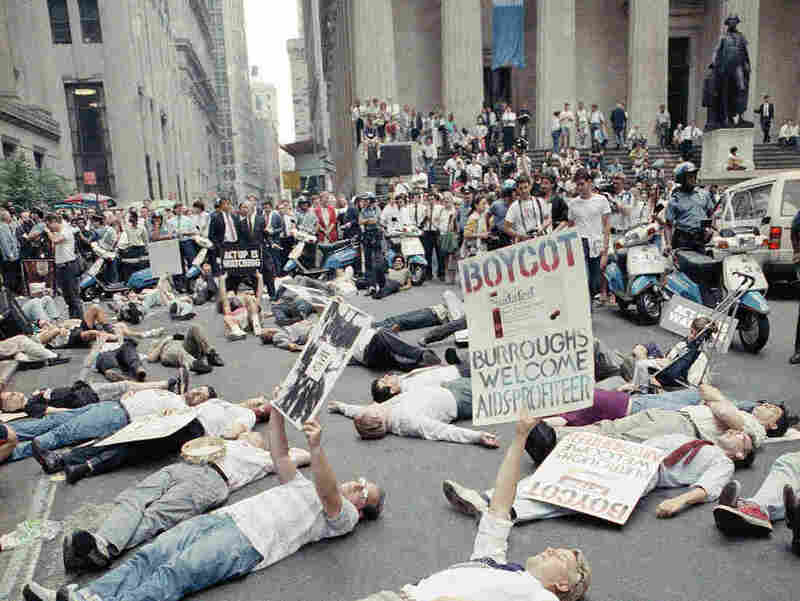 AIDS activist group ACT UP organized numerous protests on Wall Street in the 1980s. The group’s tactics helped speed the process of finding an effective treatment for AIDS. In the summer of 1985, Mike Petrelis was savoring life as young, openly gay man in New York City. He’d landed a cool job working for a film publicist who mostly handled foreign art films. He’d found an affordable apartment — not far from the gay mecca of Greenwich Village. In the Other Side Of Anger, NPR explores the biology, psychology and cultural role of anger, shedding light on an emotion that can spur violence or become a force for good. Read the rest of the series here. “He was saying that if I was going to be lucky I’d have six months to maybe two years of life left,” recalls Petrelis. Petrelis says he broke down crying. The doctor said he’d give Petrelis a moment to be alone, pull himself together. “I was so mad with hearing this news — so angry at the doctor — I thought the one best way to protest would be to light up a cigarette and just smoke it with as much pleasure as I could find,” he says. “I mean, my anger just knew no limits,” says Petrelis. But as central as anger was to ACT UP’s success, it would also prove a force for division. “I just thought because I was so angry that there should have been more angry people,” he recalls. By early 1987, with the U.S. death toll topping 40,000 and worldwide HIV infections reaching 5 to 10 million, the threat was starting to feel apocalyptic. The gay community’s mounting frustration finally boiled over in an explosive show of anger. Hundreds of gay men and their supporters took to New York City’s streets to vent their fury — first with a demonstration on Wall Street. Then a protest at city hall. Then an even bigger showdown on Wall Street. People weren’t just chanting or carrying signs. They were blocking traffic with their bodies. At the second Wall Street action, “over a hundred people got arrested,” Barr says. Many of them were people who had never contemplated civil disobedience before. “It was such a terrific feeling to be arrested with my yoga teacher,” Petrelis recalls with a chuckle. “Rallying together and expressing our anger was a really good replacement for just feeling scared all the time,” he says. “ACT UP’s ethos was that they had united in anger,” he says. This made them extremely intimidating. “They were no longer invisible sufferers of a disease. They were terrifying sufferers of a disease,” says France. So they took it upon themselves to figure out the specific roadblocks in government policy and clinical trials that stood in the way of what ACT UP wanted most: a cure. Then they unleashed their rage to force the decision-makers to hear ACT UP’s solutions. “Our goal was to seize control of the FDA,” says Barr. 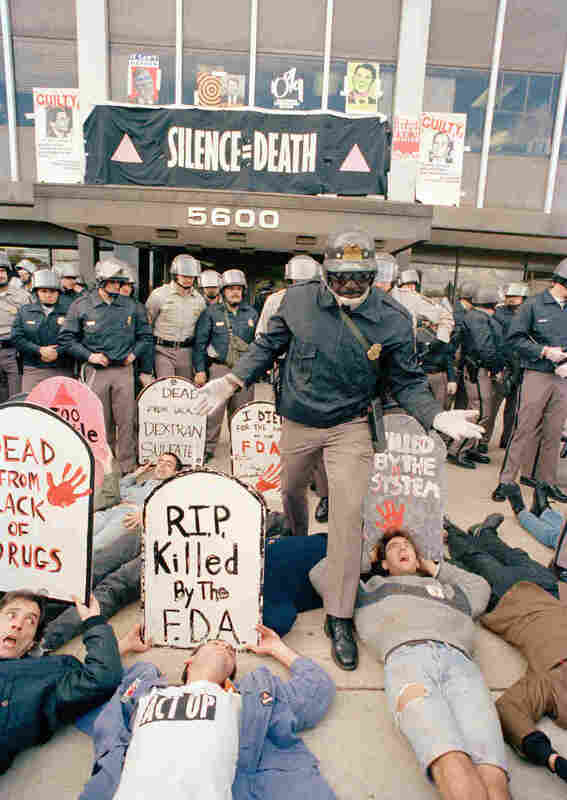 ACT UP wanted the Food and Drug Administration to give AIDS patients access to an experimental drug. The FDA wouldn’t even discuss it. So hundreds of activists converged on the FDA’s headquarters. France says the two prongs of ACT UP’s strategy were equally important. The aggressive protests got them a foot in the door, but it wouldn’t have made a difference if they hadn’t done the homework needed to offer insightful and viable proposals once they did get a meeting. “What made this work was not just the anger. But the anger coupled with the intelligence,” says France. ACT UP came to call this approach its “inside-outside strategy.” And they deployed it over and over again — with the National Institutes of Health, and then with pharmaceutical companies, eventually becoming full partners with key scientists. The upshot of all this: “What they were able to revolutionize was really the very way that drugs are identified and tested,” says France. December 1989: At left, members of ACT UP mount a protest outside St. Patrick’s Cathedral in New York. At right, activist Michael Petrelis inside the cathedral shouts “Stop killing us!” in the middle of the service. Today it seems natural that people suffering from a disease — whether that’s breast cancer or diabetes — should have a voice in how it is researched and treated. But France says this was decidedly not the norm before ACT UP. In 1996, scientists finally did find the treatment that would keep people alive. France says while scientists would probably have made the discovery eventually, there’s “no question” ACT UP made it happen sooner. But an organization that uses anger as a tool also faces a challenge. Once you get people to tap into their rage — it’s hard to control it. That contradiction came to a head for ACT UP one Sunday in December of 1989 at Manhattan’s St. Patrick’s Cathedral. Outside the church, ACT UP was staging a massive demonstration to call out Archbishop John O’Connor for opposing the use of condoms. He’d been raised Roman Catholic and had a lot of unresolved feelings toward the church. “You know condemning me as gay, just all that Catholic guilt I had been raised with,” he says. They didn’t want to disrespect parishioners, so the plan was to wait for O’Connor to begin his sermon, interrupt by reading a quick statement, then turn their backs on him in silent protest. Petrelis had a whistle with him — the kind for calling for help when you’re being attacked. He started blowing it. France’s documentary includes footage of the moment — Petrelis standing on the pew, other activists taking up the chant “Stop it! Stop it!” Still more leaping into the aisle and laying on the floor as police march in to cart them off. O’Connor continued the service. An activist lined up for communion, then took the wafer the priest had given him, and crumpled it. Barr was part of a contingent within ACT UP that felt the time had come for a new phase. He believed ACT UP’s inside-outside strategy had largely succeeded. Top policy makers and scientists were now giving ACT UP’s proposals a respectful hearing. ACT UP continued to mount demonstrations — there are active chapters of the organization to this day. But to Barr it marked the beginning of the end of ACT UP’s effectiveness. “It was a turning point where venting one’s anger took precedent over political strategy,” he says. Within a year Barr and many others who had been central to the organization’s meetings with top researchers had parted ways — splitting off into groups with a more traditional style of lobbying and politicking. In general, he disputes the notion that ACT UP became less strategic and effective from that point on. And while he concedes, what happened at St. Patrick’s Cathedral was unplanned and not in service of any tactical objective, he argues in the broader scheme it was deeply necessary. “It was a catharsis finally happening,” he says. And not just for the activists in the cathedral, he says. Petrelis has been in movie theaters when David France’s documentary has been shown.